I made this meme about the GOP primaries…. Which one will eat fewer of your children? Not that Cruz is any better. I shudder whenever I think of him, too. 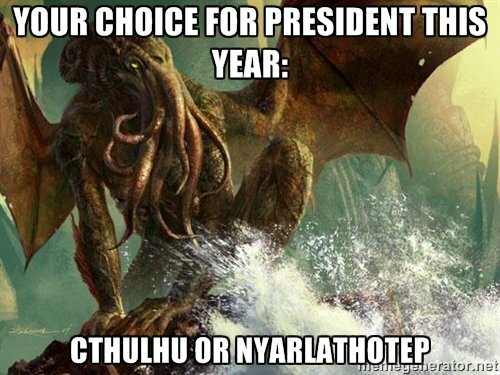 Not sure which is Nyar, which Cthulhu. Reblog: “I May Have Been Wrong About Obama”/Possible New Third Party? In fact, the top priority for Republicans wasn’t to help the nation recover from the disastrous recession created under President George W. Bush. As crudely articulated by Senate Leader Mitch McConnell, the top Republican priority was to make sure Obama wasn’t re-elected to a second term. The Republican calculation was simple. If American economic misery continued for four more years, voters would be so enraged they’d throw out Obama and vote Republican. That’s why Republicans began their cynical, anti-American program of voting against every Obama effort to create jobs and eviscerating the government’s economic safety net when it was needed most, making it even harder for struggling families to survive. It’s difficult to say how much of the Republican opposition to Obama was rooted in racism. But the sheer contempt shown the first African American president was furious and unrelenting. It led directly to 2010’s tea party backlash election that elected Gov. Scott Walker and other hard-core, right-wing politicians across America…. Republicans claim it’s not Obama’s race they hate. It’s his extreme left-wing policies. Except that President Obama doesn’t really have any radical left-wing policies. He’s a moderate Democrat, which is still a mainstream political philosophy in this country…. It’s Republicans who have left the mainstream. 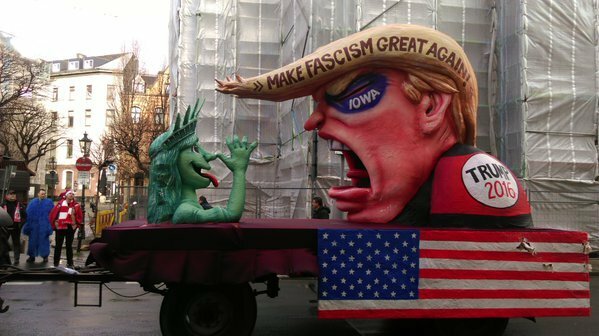 Now intelligent Republicans are watching in horror as racists destroy their party by nominating an unelectable, know-nothing demagogue.